It was the “End of an Error” and the beginning of a “Reign of Terror,” for on December 21, 2013, the officers of Ubar Grotto were Installed for the coming year. George is out – Tim is in. The king is dead, long live the king… and all that rot. The Prophets gathered at 6 PM at the Spring Garden Conference Center for social time and light refreshments prior to the Installation. Many took this opportunity to get their final jabs in at George before the end of his reign. The mood was festive as everyone was looking forward to the holiday season. At 7 PM, the officers declared the Grotto open and the ceremonies began. Pro. Hindson delivered his final remarks, many of which were very heartfelt. The Prophets, however, were not swayed by this showing of emotion, finding it a sign of weakness instead. Calls for George’s impeachment were loud, but short lived. The first item on the docket was the presentation of the newest Sheik of Ubar. The officers of the Grotto chose Pro. Russell W. Baker for his outstanding service and spirit of good fellowship. Many remarked that choosing Russ was the best decision the Monarch had made all year and everyone was pleased with the selection. The Installing team then took the floor, comprised of Pro. Seth C. Anthony, PM, Installing Officer; Pro. George H. Hindson, PM, Installing Marshal; and Pro. Kimber D. Smith, PM, Installing Chaplain. 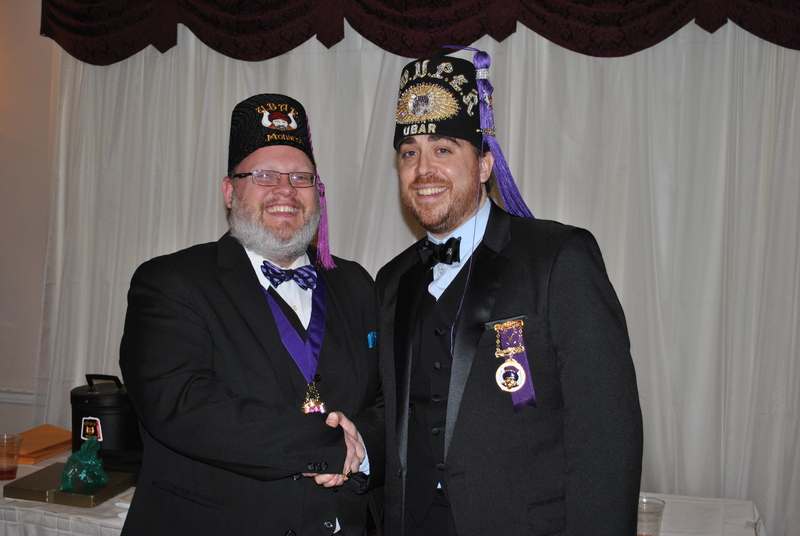 Using the proscribed ceremony, the officers were each installed in solemn form, presented with their fezzes and jewels, and escorted to their seats. The Grotto was now under the control of the dictator known as Potent Monarch Timothy Ralph Settlemyer, the “Tyrant Tim,” and the Prophets were fearful for the future. In a show of great humility, Tim let the retiring Monarch make a few special presentations, known as the Monarch’s Award of Distinction, which were well received by the crowd. His final duty being performed, Pro. Settlemyer presented George with his Past Monarch’s fez and jewel, telling him to go sit on the sidelines, where he belongs. The formal ceremony being concluded, the Prophets enjoyed a time of refreshment, including cigars in the gazebo and good fellowship inside. The year of George is at an end and the year of Tim is just beginning. A toast, to the future of Ubar Grotto!